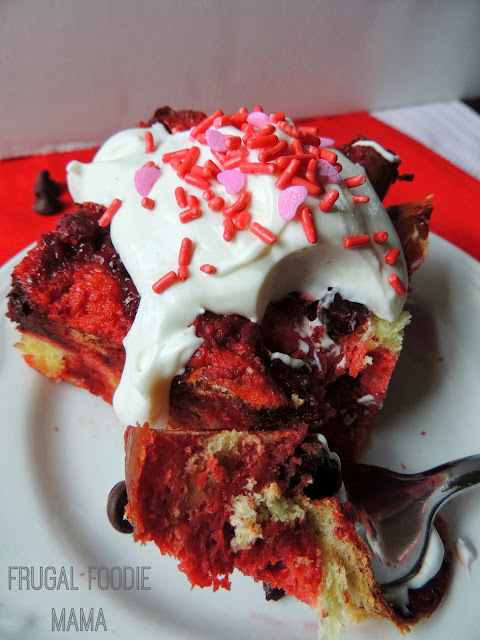 I dived right into the red velvet craze that always seems to be hitting the internet and showing up in Google searches in rapid fire around this time of the year. In general, I can take red velvet or leave it. My husband loves red velvet- it ranks right up there with cheesecake for him. Some day I will have to tell you all the story about the year I decided to make this red velvet/cheesecake layered birthday cake -from scratch- for my husband.... It was a logistical nightmare, but so crazy delicious. ;) Not pretty, but everyone raved about how amazing it tasted. In a small saucepan, heat the white chocolate chips and half & half over medium heat stirring constantly. Once the chocolate chips are melted and creamy, stir in the cream cheese. Continue heating until the cream cheese is melted and well incorporated, stirring constantly. Remove from the heat and whisk in the powdered sugar. Pour into a bowl and refrigerate for at least 30 minutes, stirring 1-2 times as it chills. Prepare your mini bundt pans (you could also use a tin for large cupcakes or muffins) by spraying with cooking spray. Set aside. 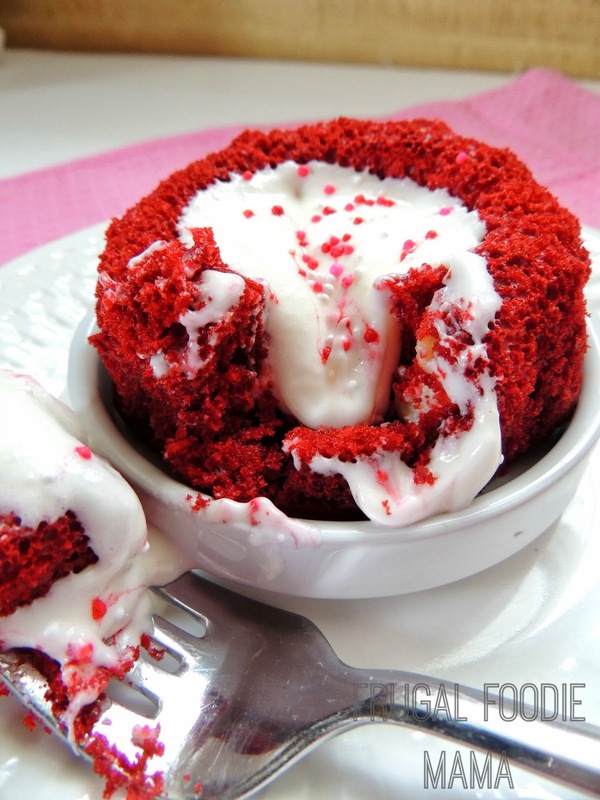 In a large bowl, beat together the red velvet cake mix, water, canola oil, and egg. Divide the batter evenly between the 4 prepared mini bundt pans. Take the chilled cream cheese/white chocolate mixture from the fridge. Drop a generous rounded tablespoonful of the mixture into the center of each bundt cake. Press down with the back of a wooden spoon. Don't worry if the white chocolate mixture isn't completely covered. The cake will bake up around it. Place the mini bundt pans on a cookie sheet and bake at 350 for 15-18 minutes, or until set. Allow to cool in the pans for 10-15 minutes, and then transfer to a wire rack to cool to warm. 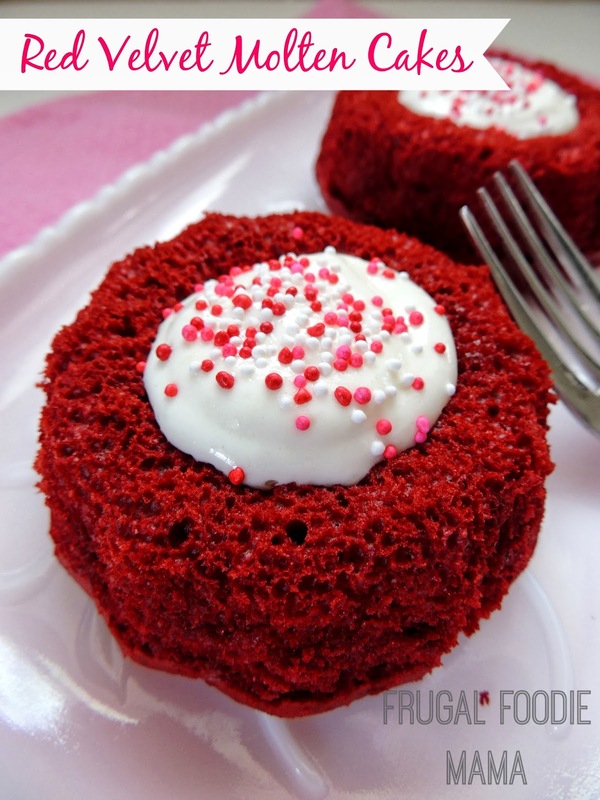 While the red velvet molten cakes are cooling, beat together the cream cheese and powdered sugar in a small mixing bowl. Whisk in the vanilla and milk. Serve the cakes warm with dollop of the cream cheese icing on top. Garnish with Valentine sprinkles, if desired. **Note- the bottoms of the mini bundt cakes will probably bake up rounded. Using a bread knife or a serrated knife, just trim a little off the bottoms of the cake so they will sit flat on the plates. 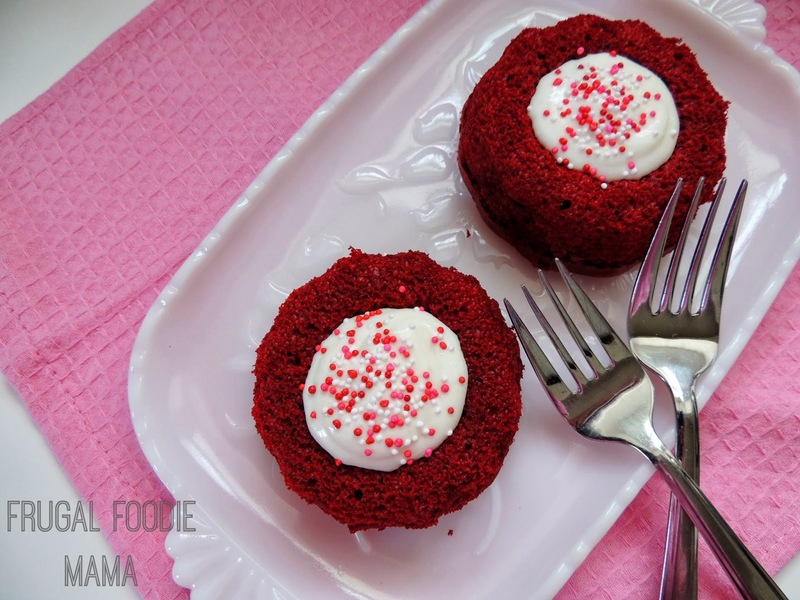 Even if you are not a fan of red velvet, you could always substitute the red velvet cake mix in this recipe for a flavor of cake mix that you love more. So, where do you stand on red velvet? Love it or leave it?